The ultimate question when trying to decide where to build a cattery has to be, where are the largest number of potential customers likely to live. A prime business location is going to be the most expensive to start with, but you have to decide if the extra cost is worth the potential increase in trade. One of the easiest ways to determine the business potential for a new boarding cattery, is to talk to established businesses. Most cattery owners will give you an honest response as to how many customers they turn away at peak periods. The receptionists at Veterinary surgeries take many calls from cat owners looking for a for a good boarding cattery and they will give you an idea of the number of cat owners who are registered with them. Try to speak to as many veterinary surgeries as possible. The choice between a town or rural setting will depend on your own preference. Some people cannot bear the thought of living out of town and would never therefore be happy running a boarding cattery somewhere in the country. Others can see themselves in an ideal setting surrounded by fields trees and cats. In the first instance you should look for a location where you will feel happy. There will be a demand for good boarding catteries in both locations. Being located in a town might have its drawbacks as parking for your clients cars could be a problem. 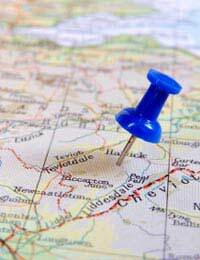 The advantage of a town location is that many of your clients could live close by and could probably walk to you. The housing in towns is far more concentrated than in a rural setting so your client base is far more concentrated. In town you could find yourself at odds with your neighbours as you would probably not have the open area that a more rural setting would provide. A rural setting for your business gives you greater flexibility with your buildings and layout. You can make the outside space look very attractive to clients, and potential clients, as first appearances do count. A drawback to a rural setting is that you are mainly relying on car owners for your client base. An ideal location would be semi-rural with a couple of medium size towns in close proximity. This would indeed be a prime location. Ultimately you must feel happy with your choice of location as taking the decision to open a cattery is a complete life style change. In town with a reasonable size garden you could probably accommodate ten pens/chalets. Because of the proximity to your own dwelling you could probably dispense with the need for an office and either use a room in your house or have a shed in the garden set up for use as an office. When you have a large plot in the rural setting you can apply for permission to erect a cattery to whatever size you think you can fill and manage. Possibly the Council will restrict you to a certain size building, but it is always worth aiming for the maximum. I have moved to a property with a large empty basement, can I turn this room into a small cattery?